Jamie Herman, one of Canada's biggest Racketlon enthusiasts and the coordinator of the Canadian Racketlon Tour (see homepage) reports below from "Le Championnat Multisports de Racketlon" (also known as "The Multisports Open Racketlon Championships") that was held in Montreal (or, to be precise, in the city of Laval in the "Greater Montreal Area") over the weekend. It has to be considered a major breakthrough for Racketlon since it was the first Racketlon event (as known to Racketlon.com) in a French-speaking area in the second largest French-speaking city in the world! Only Paris is bigger. The weekend in Montreal had beautiful weather with a bright sun and clear blue skies. An excellent compliment to a wonderful weekend of Racketlon. This challenger event in Montreal proved to be a great success with exactly 60 entries and action packed matches. The facilities at the Carrefour Multisports centre were beyond anyones expectations with only the finest racket facilities. Even Horatio Pintea (former Canadian Olympic table tennis player) was pleased with the quality of table tennis tables used for the tournament which was recently bought by the sports centre. from the hands of tournament director Rodrigue Bédard. The challenger event attracted some big names in the Elite Draw. A few to mention are Stephane Cadieux (Badminton Specialist from Toronto), Horatio Pintea (Table Tennis Specialist from Ottawa) and Alexis Charpentier (Tennis Specialist from Montreal). The variety of high quality skill levels added to the excitement if this event since it appeared that the winner could essentially go to anyone. Not to mention the list of unknown players in the A draw who had never competed before which added even more kick to the draw. For the Mens A draw the real action began in the semi-finals between Stephane Cadieux and Gary Helmkay (Badminton Specialist and former O45 Canadian Champion). Stephane began by giving Gary some trouble in table tennis with his new racket provided by Canadian Racketlon Tour Coordinator, Jamie Herman. This racket contained a basic red rubber on the forehand side but tricky medium pips on the backhand side to make any table tennis player feel uneasy. It gave Stephane that slight advantage he needed to beat Gary 21-14 in table tennis. This brings us to the most interesting part of the match with two badminton specialists. Stephane began the match with his typical technique of low fast clears to get you out of position. This also punishes you for not being in a ready position and keeping you racket up. Even the experienced Gary could not forsee this tactics letting Stephane walk over him by a 21-4 defeat in badminton, a sport which Gary himself rarely lets many get over 8! Down by much and given Stephanes strong squash and tennis background, Gary was in trouble. Stephane won the squash 21-13 making it unnecessary to play tennis. The most interesting and critical part of this match to watch was the badminton since it was a good opportunity to see the true difference between the different skill levels. Many learned a lesson or two by watching this match. The other semi-final was between Horatio Pintea and Alexis Charpentier. The first time Alexis played Horatio was at the Canadian tour event in Ottawa last autumn. Then Horatio strongly defeated Alexis in table tennis and badminton while Alexis made full advantage of his tennis keeping Horatio at 7. At their second meeting at the Canadian Open this past March, Alexis took revenge on Horatio by defeating him by a +6 margin in the consolation final, the difference this time was that Alexis defeated Horatio in badminton. This background meant that much interest was focused on their third encounter. The match began strong for Horatioa beating Alexis in his weakest sport 21-1. Next came the most crucial part of the match, badminton, since in the previous encounters the winner of the badminton was also going to be the winner of the whole match. Alexis and Horatio fought some very long and grueling rallies making the match difficult and tiring for both of them. Alexis came out on top by winning 21-15 and the match was still uncertain at this point. Squash gave more insight into the final result. Horatio have begun playing squash a few times a week after the last Canadian Open but nevertheless Alexis stole the show by winning 21-11 in squash. This meant that Horatio was only up +4 going into Tennis which was not very favourable for him. Today was a special day though and the gods were smiling on Horatio as he shocked the audience by defeating Alexis in tennis 21-13. Everyone watched in awe as Horatio played such incredible points against a tennis specialist who is seen as almost flawless. 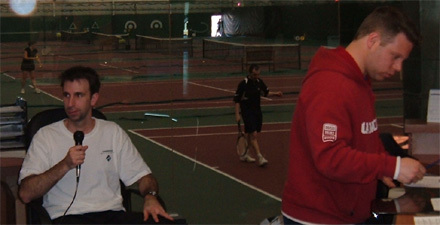 In fact, Alexis beat Richard Thomson is tennis at the Canadian Open to illustrate how strong he is. Horatio was a regular André Agassi and generated long deep balls and quick paced rallies. He made very many perfect passing shots and played possibly to a level he has not played at before. With such a thing happening in tennis, it is exciting to see how this Racketlon match played out. 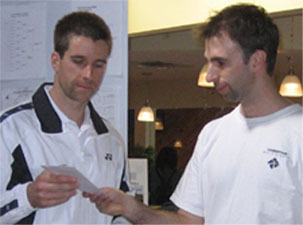 It left Horatio Pintea and Stephane Cadieux to play in the finals. Gary Helmkay defaulted his ¾ match giving Alexis 3rd place in the A flight with some prize money. The finals proved to be very interesting since Horatio has greatly improved his badminton, squash and tennis since he last played Stephane. These were all aspects Horatio needed to improve in order to have a fighting chance against Stephane. Horatio quickly made advantage of his strong sport by defeating Stephane 21-4 in table tennis. He mentioned before the match began that the medium pips which were going to be used to trick him would fail and it did. It was going to be interesting at badminton since Horatio greatly improved it since they last played. Stephane was shocked by the first half after having had to give up as many as 7 points to Horatio. However, after that Stephane didnt budge and won 10 straight points giving him a 21-7 win. Horatio was not pleased with this result but moved onto squash. In the squash game the score was 11-10 for Stephane at the break point, at which time Stephane changed his strategy and pulled the same move as he did in badminton by getting 10 straight points; 21-10 and a +8 lead going into tennis. Horatio's impressive play earlier that day in tennis was surely to send shivers down Stephanes spine. But Stephane has a very solid tennis background and was able to overcome Horatio by defeating him 14-5 giving him an overall win by +17. 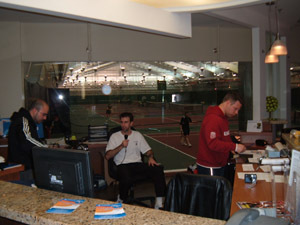 Tournament director Rodrigue Bédard giving an interview for the local TV station, while co-organiser Christian Foisy (in red) is busy controlling the tournament at the control desk. Some notes to mention in Womens A finals that Shona Kerr (former Canadian Open Womens A Champion hailing from the USA) placed first, Kathy Cowper (Quebec) placed second and Line Bellerose (Quebec) placed third. 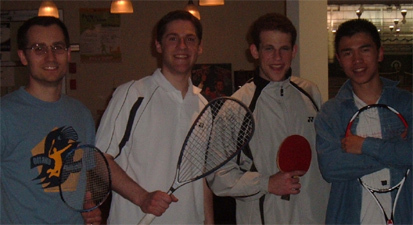 The Mens B final was a victory for Jamie Herman (Toronto) over Geoff Miller (Toronto). The winner of the final round robin in the Mens C Category went to local Marc Gentile. 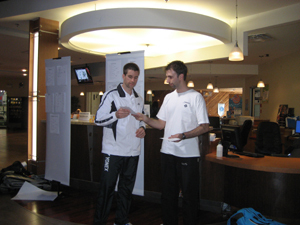 Horatio Pintea (Ottawa) defeated Gary Helmkay (Toronto) in the O45 final which retains his title as the reigning Canadian number 1. The U21 event resulted in a draw between Jamie Herman (Toronto) and Jeremy Easterbrook (Quebec) since the final could not be played by any of the participants. Lastly, a special mention goes out to the match between Stephane Cadeiux - Martin Marion (Ottawa) +3. A very small margin.We should expect to see Martin Marions name in the near future as a top Canadian A player. Also, the first match of the day in the C category resulted in a gummiarm win for David Liu. It is rare that the first match results in a gummiarm. Otherwise a special thanks goes out to Rodrigue Bédard, Christian Foisy and all of the volunteers at the Carrefour Multisports Centre. The tournament ran smoothly and was well organised. It is believed that it will expand for next year since the newcomers from Québec really enjoyed the tournament and will likely spread the word about it for next year. For complete results, see tournament homepage.